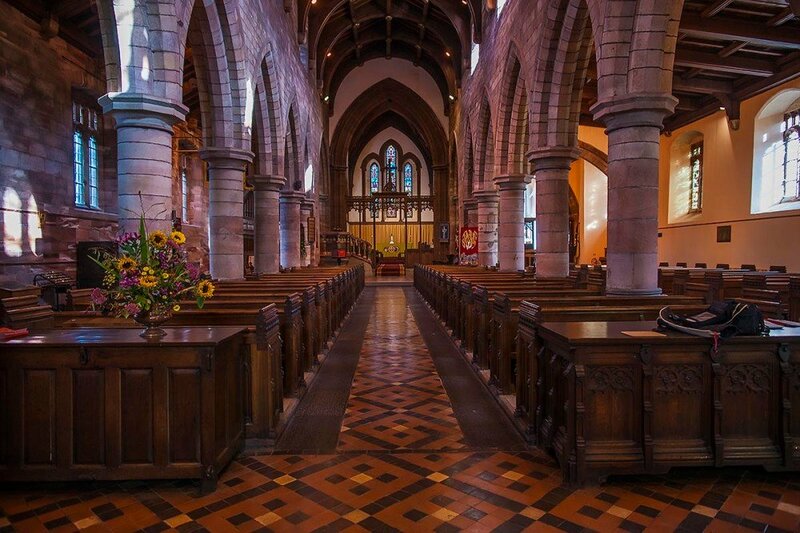 The most famous carved stone in Kirkby Stephen Parish Church stands by a pillar, confronting you as you come in. It is the so-called Loki Stone or Bound Devil. It is obviously a section of a slab-like cross shaft. The carvings on the sides are simple patterns of twisted strands but that on the face is unique. It is the figure of a man with arms hanging from broad shoulders and with palms out-spread. His feet are shown in profile. His mouth, eyes and nose are incised into the stone. A V-shaped incision below the chin may be a beard or the open neckline of his clothing. Curving projections like ram's horns jut from either side of his head. A circular strap passes across his waist and behind his legs, and his wrists and calves are bound to this strap by rings. A projection points upwards between his legs and appears to be an anchorage for the circular binding strap. People have puzzled over this carving since it was discovered in the fabric of the chancel during the rebuilding of 1847. Authorities state that deformed men with large shoulders and hanging arms are typical of Viking Northumbria and the Isle of Man. Ring and bar bindings are also said to have a long history in Scandinavian art The carving is certainly Viking, and dates from sometime between 900 and 1000AD. But who is the figure? Popular tradition identifies it with the Norse god Loki, who in legend was bound by his fellow-gods to a stone and tormented by fiery venom dripped from a serpent. He is so depicted on a carved memorial stone on the Baltic island of Gotland. 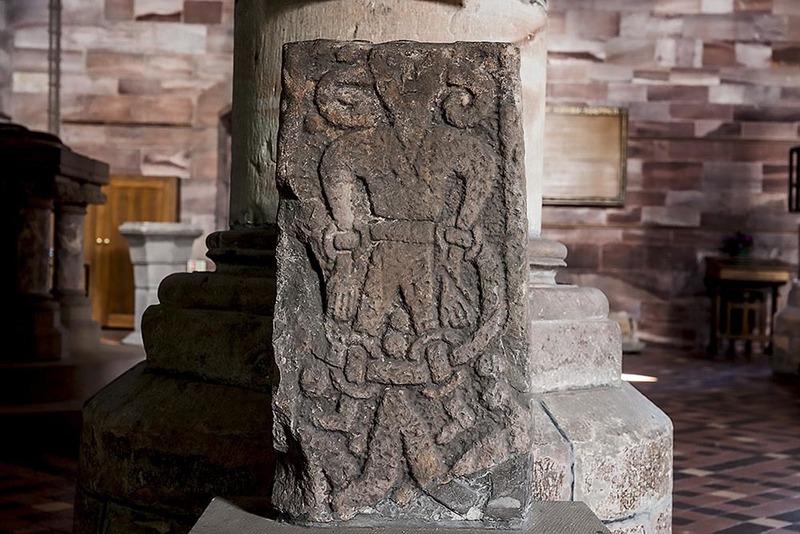 Other scholars see similarities between the Kirkby Stephen figure and carvings of Volund (Wayland) the Smith at Leeds and Great Clifton in Yorkshire. Yet others find the 'horns' at Kirkby Stephen unusual in curling down, whereas they curl up in the nearest similar carving, from Gainford in Durham. This leads on to the suggestion that they are not horns at all but mere decoration! (but if you go out and look at the nearest Swaledale tup you will see horns very like those on the Loki stone). In the face of all this uncertainty we in Kirkby Stephen hold to the theory that the figure is a bound devil, possibly Loki. Maybe on the original cross it was surmounted by a figure of Christ the Redeemer, supreme over evil. If so there would be an analogy with a Nordic stone from Gosforth where one panel shows the legend of Thor fishing for Loki's son Iormungand, the serpent of evil who encircled the Earth, and failing to destroy the monster - with above it on another panel the Lamb of God trampling on the serpent. The message: where the Old Gods failed Christ is triumphant.